A small team of 3 surveying engineers set out on a sunny week in July for a 3D documentation of the archaeological site in Grand (Vosges, France) a well-known and internationally important ancient Roman city. The surveying took place mainly in the mornings and late afternoons for a period of three days. The reason for this was also to not interfere with the research team of more than 80 participants working on the excavation site. For the documentation process ArcTron’s engineers used terrestrial 3D laser scanning and digital photography from the ground. Together with the digital photographs from the UAV all data was merged. As a result, we delivered a very high-resolution, photo realistically textured 3D model with a ground resolution of approx. 1cm of the entire excavation area. Some sections of individual walls and ditches were given particular attention. 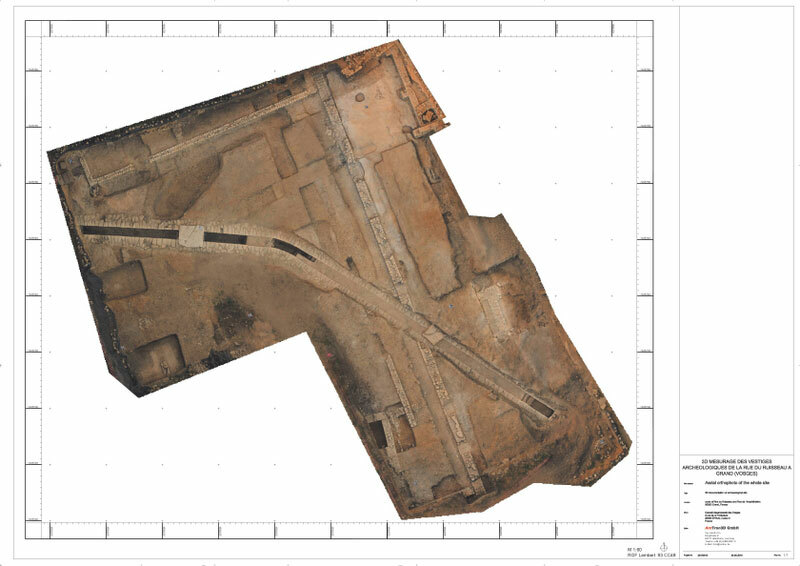 Here we could see that the data from our camera copter (UAV – “Unmanned Aerial Vehicle”) fused efficiently with the data of our terrestrial 3D laser scanner. In addition to the photo-realistic 3D models all necessary CAD data (floor plans, sections) and high-resolution Orthophotos of the entire excavation area were created. Read below for more information about this excavation site and the associated research project. Since the 18th century, Grand has revealed many remains which reflect the importance of this town and, in particular, its monumental ensemble. In the 1960s, Edouard Salin started a new phase of studies characterized in particular by the search of Apollo’s temple. Its existence was suggested by Jean-Baptiste Prosper Jollois in the 19th century. The syntheses carried out in 1980s and 1990s led to consider this archaeological site as a vast religious complex focusing on a sacred spring and protected by a monumental enclosure. 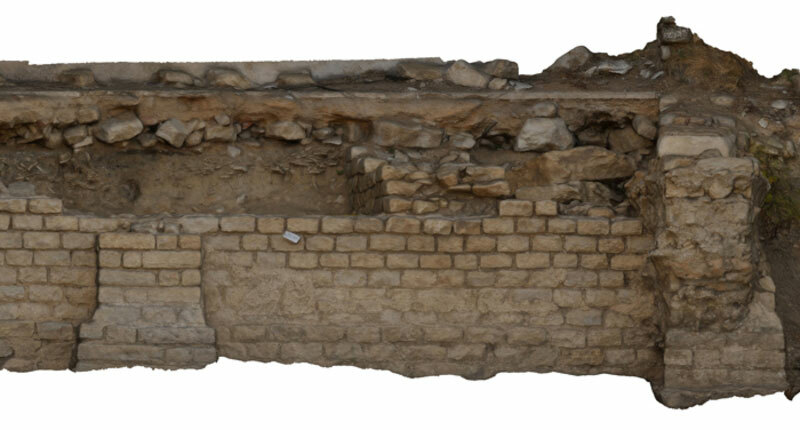 The objectives of the current Collective Research Project are to establish reference documentation on the old excavations, continue to study the collections and develop new lines of research, specifically on the housing forms, circuit of the groundwater, urban organization and land used around this town. The area on which the findings take place rests along the East-West route that connects the amphitheater with the center of the city. The parcel is located at the foot of the Eastern rampart which is well preserved beneath some of the houses of Ruisseau Street. The research started in 2010 which revealed Gallo-Roman remains of an area of more than 3000 m2. A monumental portico 6 m wide and over 40 m in length gave access to the thermal baths of the amphitheater. The hydraulic line that passes through the search area likely fueled the baths.